The M.H. 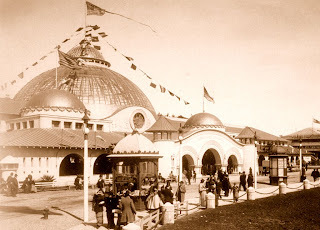 deYoung Museum, in San Francisco's Golden Gate Park, is a descendant of the Fine Arts Building remaining from the 1894 California Midwinter International Exposition. After the close of the exposition, numerous paintings and art pieces were obtained from the fine arts exhibit, and assembled with other displays to form a permanent museum. 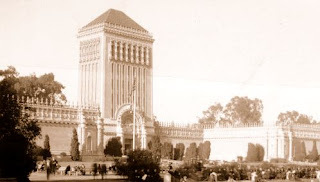 The Memorial Museum became San Francisco's first municipal art museum, and was housed in the Egyptian style Fine Arts Building, remaining from the Midwinter Fair. By 1921 a new structure had been added, to house the growing art collection of the Memorial Museum. The new building, constructed on the former site of the Midwinter Fair's Horticultural & Agricultural Building, was named the M.H. deYoung Memorial Museum. In 1928 the original Memorial Museum was deemed structurally unsafe, and demolished. The 1921 deYoung Museum was designed in a Spanish Plateresque style, and covered with delicately molded concrete ornamentation. By the late 1940's the ornamentation was crumbling badly, and a decision was made to simplify the building's exterior. 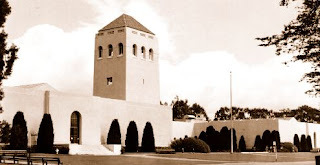 The ornamentation was stripped off, and the building redesigned in a more simple Spanish-moderne style. By 1965, the museum occupied a complex of eight buildings. The Loma Prieta earthquake of 1989 caused significant structural damage to the deYoung, and plans were developed to construct a new museum. The old buildings were demolished in 2001, and a new copper-clad deYoung was opened to the public in October of 2005, complete with a 144-foot high observation tower, which offers unobstructed views of Golden Gate Park.